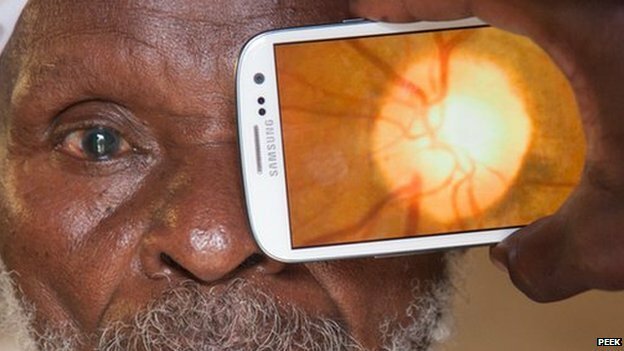 The University has teamed up to create a smartphone device which health workers can use to carry out eye tests and could tackle blindness around the world, according to scientists. The London School of Hygiene & Tropical Medicine and the NHS Glasgow Centre for Ophthalmic Research have collaborated and created the Portable Eye Examination Kit (Peek). Peek consists of smartphone apps and an adapter which can be used anywhere in the world to test eyes easily and inexpensively. The Peek Retina smartphone adapter clips over the phone’s camera, allowing workers to see inside the eye, save the photos and then send them to experts for diagnosis and subsequent treatment. It could help detect eye diseases and other health problems, such as diabetes and high blood pressure. People are being encouraged to raise extra funds to manufacture and deliver Peek tools through crowdfunding site Indiegogo. Dr Giardini, lecturer in the Department of Biomedical Engineering at the University of Strathclyde, said: “Peek Retina is the optimal combination of solid engineering experience, ingenuity and outlook to social impact. Peek was formed after co-founder Dr Bastawrous struggled in transporting bulky eye equipment to remote areas in Kenya during a community study as part of his PhD at the School. He teamed up with his fellow Peek co-founders, Stewart Jordan, software developer at the London School of Hygiene & Tropical Medicine, Dr Mario Giardini and Dr Iain Livingstone, to investigate the potential power of smartphones. Last year, Peek received funding from The Queen Elizabeth Diamond Jubilee Trust towards its research and development. As a result of this support, the team will be conducting a pioneering series of trials over the next five years to test the technology in various settings and communities including Kenya, Mali, Tanzania, Botswana, Malawi, India and the UK. Up to 80 per cent of all blind people have lost their sight through preventable or treatable conditions- however, millions of people around the world are still not able to get treatment.